It's been FOUR FIVE - LONG - YEARS and after a couple of heartbeaks, dozens of blow ups, hundreds of laughs and even more frustrations -- a total of 1,713 short stories told.. I am still me. I'm laughing because I don't see it as a good thing..
Ah, well.. Happy Anniversary, Blog!! Man, it's going to be so hard to commit to anything else than this, for as long as I have. You've been Waiyumeiwei, and now you're Redbubbles.. It's all been good and I look forward to sharing the future with you; whether I like it or not -- irrelevant. I'd like to think that I've grown since my first entry. A little at least, 'cause reading them back is kind of embarassing actually. I sound like a goofy, dotty 15 year-old that grins too much. I don't know, I get that sort of vibe from my old entries anyway. I do prefer the morbid present-me really. I can't believe I've had this for five years. I'm bad at maths, I thought it had only been four but Bahijah helped me add it up; really, it's been five. Man! Time really do fly. Crap! I just thought that this song is very appropriate to how I feel right now. Well, these days actually.. 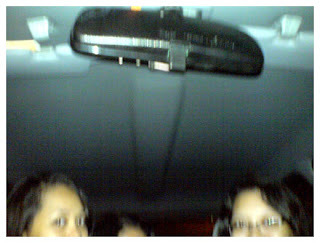 Spent a funny-yesterday with Ana, Bahijah and Ilsa. 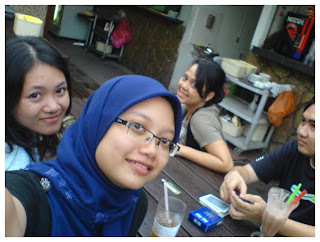 They came over to Shah Alam and called me out to plaaay! hihihi! Thanks guys! I had good fun! I've uploaded those songs you requested on my LL by the way! Tapi lagu Kejamnya Dirimu tu terpotong! ahhahha! Time tu song recorder memang tak cukup panjang kot. Ohh! And the video I did is officially LOST!! grrr. O yeah.. on a side note, I don't hate my life. I'd never say that. It just bugs me that anyone would think that I do.